Few days back Twitter introduced a polling feature. Any Twitter user can now create poll on twitter to take Twitter users’ reaction on anything. You can give two options in poll. Poll will remain active for 24 hours and it will show live notifications to both poll creators and users who are responding to it. Poll on Twitter will be similar to a tweet. So, you can also pin it on your profile. In this article, I will explain how to create a poll on Twitter. 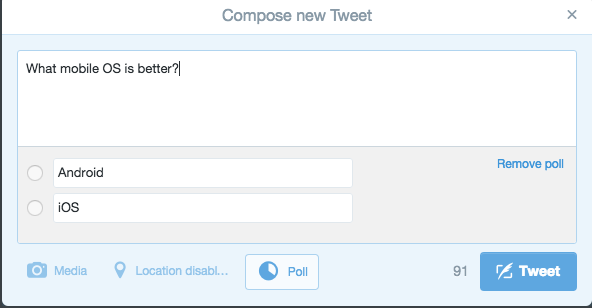 To create a new poll, click on compose tweet button on web or mobile app. You will see a new poll option there. Click on this to start creating a poll. Clicking on Poll button will open two check boxes to add tweet options. It will create a new poll on Twitter. This poll will be available on Twitter for 24 hours. Anyone seeing this post can participate in this poll and it will reflect the result in real time. So, you will be able to check the live poll results. Results of the poll will be something like below. You can see the number of votes and live poll result. This is a very basic but interesting feature. It is helpful for brands and people with good following. It will increase engagement and help in getting reaction from users instantly.